So far asouthin has created 20 blog entries. Soul Sister’s tells the story of the birth of Soul Music and R&B for women. Starting with Big Mama Thornton, Etta James, Soul Queen Aretha Franklin, and Gladys Knight, through the 60’s and 70’s with Patti LaBelle, Diana Ross and Tammi Terrell. The show also includes the music of Tina Turner, Chaka Kahn, and Janet Jackson. 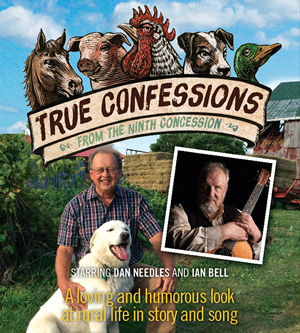 Dan Needles is a familiar face to Theatre Collingwood audiences and to the community. 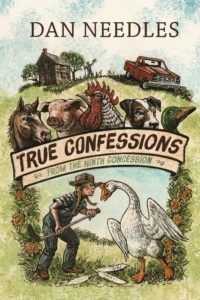 He penned the entire Wingfield Farm series and in 2003 he won the Leacock Medal for Humour. 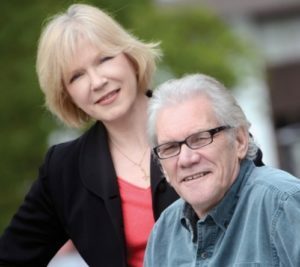 For this delightful evening he joins Ian Bell, folksinger, storyteller and founding performer of CBC’s Vinyl Café, to take you on a ramble through the back roads of rural and small town Ontario with stories, songs and lots of laughter. What would you do if you could hit the re-set button on a stale marriage? Paula and Sam have finally decided to pack it in as a couple. As they divvy up their household goods they wonder what would have happened if they’d never met. Would their dreams and young ambitions have come true? The discovery of a long-forgotten wedding gift sets off a chain of events that transports them back to their college days and the opportunity to rewrite their history together. This wonderful musical reunites playwright Norm Foster and composer Steve Thomas – co-creators of audience favourites Jasper Station, Race Day. Premiering at The Foster Festival just before coming to Collingwood, this comedic musical is funny, irreverent, and ultimately a feel good story. Trademark Norm Foster! 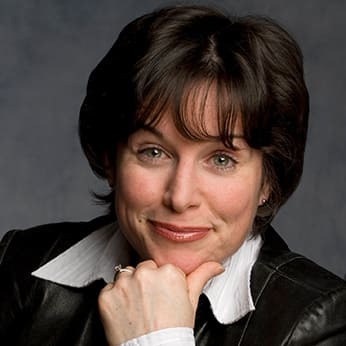 Gabrielle has spent twelve seasons with The Shaw Festival, six seasons at The Stratford Festival and, over the past five years, has appeared in many productions for Drayton Entertainment. Gabrielle lives in Niagara on the Lake with her husband, Shaw Festival actor Peter Millard. Jonathan is a graduate of Ryerson University with a Bachelor of Fine Arts Honors degree in Performance and a 2015 participant of the Banff/Citadel Professional Development Program. Breton is zealous about making her Foster Festival debut, back in the city where she first began her acting career (thanks to all the folks at Garden City Productions!). 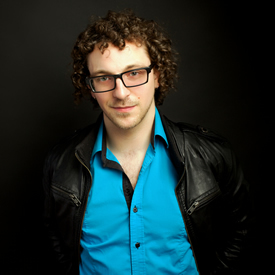 Breton is a recipient of the Theatre Ontario Emerging Artist Award and a Broadway World Award. Thanks to Seventh House and family for the continuous care and good vibes! Enjoy the show! Griffin is an actor, writer, musician and composer from Regina, Saskatchewan. He is a recent graduate from Sheridan College’s Bachelor of Music Theatre Performance program. 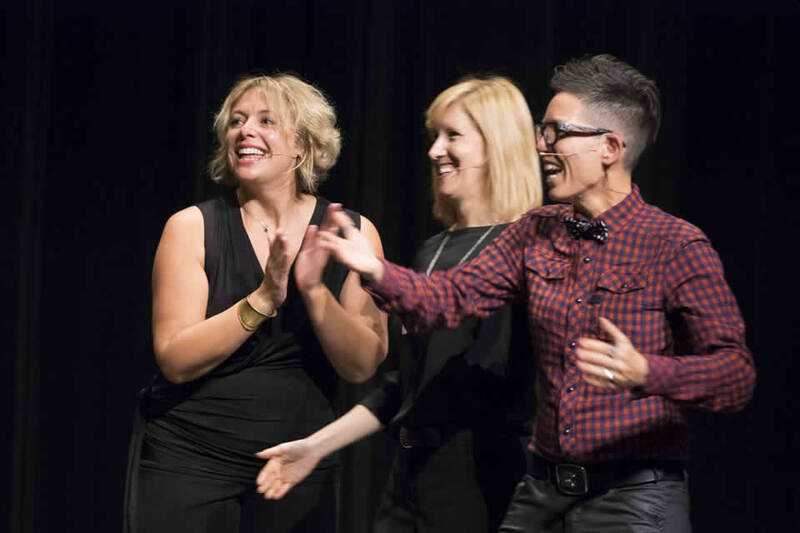 Griffin is passionate and excited about the creation of new Canadian works, specifically new musicals, and hopes to continue to participate in their creation for years to come. HAS IT BEEN 50 YEARS ALREADY?! Join us for a sunny celebration of one of the most iconic years in music & pop culture, with songs from The Beatles, Johnny Cash, Elvis and The Guess Who, to television classics like Hee Haw and Sesame Street. So turn up the radio and let’s travel back a half-century to the carefree summer of groovy tunes…and the first man on the moon! David Rogers and David Hogan produce nothing but stellar, sold out shows and we are delighted to bring their quality entertainment to Collingwood. Songs will include: Galveston, Sugar Sugar, Everyday People, These Eyes, A Boy Named Sue, Honky Tonk Women, Get Together, In The Ghetto, and Sweet Caroline! We are thrilled to announce that following her performance in the Canadian Stage Company’s production of Next To Normal in April/May 2019, Louise Pitre will be making her way to Collingwood to perform for us in June in a very intimate show highlighting her magnificent musical career portraying the legendary Edith Piaf to the starring role in Mamma Mia, and everything in between! Receiving a Tony nomination for her Broadway debut in the smash hit Mamma Mia! was a highlight for Louise Pitre, Canada’s first lady of musical theatre, in a career that spans theatre, television and concert stages across North America and Europe. In addition to headlining the Toronto, Broadway and US touring company casts of Mamma Mia!, Louise is known for her signature performances as Fantine in Les Misérables (Toronto, Montreal and Paris), the title character in Edith Piaf, Mama Rose in Gypsy (Chicago Shakespeare Theatre, Gary Griffin director)and Joanne in Company (again with Gary Griffin). In September, 2009, Louise made her Carnegie Hall debut singing the role of Ulrika in the concert version of the musical Kristina by ABBA’s Benny Andersson and Bjorn Ulvaeus which she reprised at Royal Albert Hall in April 2010. In 2013 Louise premiered her self-penned one-woman show On The Rocks at Theatre Passe Muraille in Toronto with original songs by Louise Pitre, W. Joseph Matheson and Diane Leah. 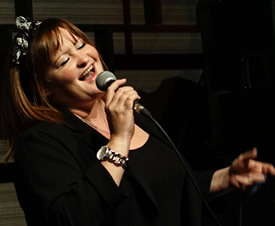 Louise has guested with orchestras across Canada and the U.S. and appears in concert regularly throughout North America with accompaniment ranging from big band to solo piano. She was chosen to be one of the three judges for Andrew Lloyd Webber’s CBC series Over The Rainbow. Louise is the winner of a National Broadway Touring Award, a New York Theatre World Award, a San Francisco Theatre Critics’ Award, a Betsy Mitchell Award and four Dora Mavor Moore awards, all for best performance by a leading actress in a musical. ONE STEP AT A TIME is a theatrical testimony to the power of faith, love and teamwork, in which a stay at home father learns to balance a successful career in the performing arts while raising two daughters, and anticipating the arrival of a son diagnosed with spina bifida and hydrocephalus. 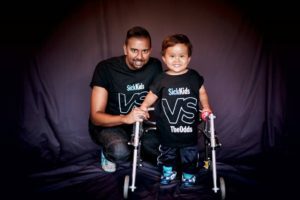 Using monologues, original songs, and improvisational tap dance, Andrew Prashad shares he and his wife’s journey of caring for Ezra. The production is so touching and perfect for an intimate theatre space. It includes a post-show Talk Back with updates on Ezra and a Meet & Greet. Expected run time: 1 ½ hours. Andrew Prashad is a multi-disciplinary artist and quickly becoming one of the leading tap dance artists in Canada, teaching and choreographing across North and South America. He is an award-winning actor, composer and writer, having recently had his self- produced short film officially selected in 12 festivals around the world and winning 4 awards including BEST SHORT FILM. He was a featured singer and dancer on the 20th Anniversary World Tour of RIVERDANCE after which he performed in ANYTHING GOES with Drayton Entertainment. After returning from doing the record-breaking world premiere of Mira Nair’s MONSOON WEDDING musical at the prestigious Berkeley Rep Theatre, he played Cogsworth in Young People’s Theatre’s production of BEAUTY AND THE BEAST. He’s just returned from Newfoundland playing Billy in ONCE at Theatre St John’s and will soon head out to Neptune Theatre for a lead role in Cinderella. 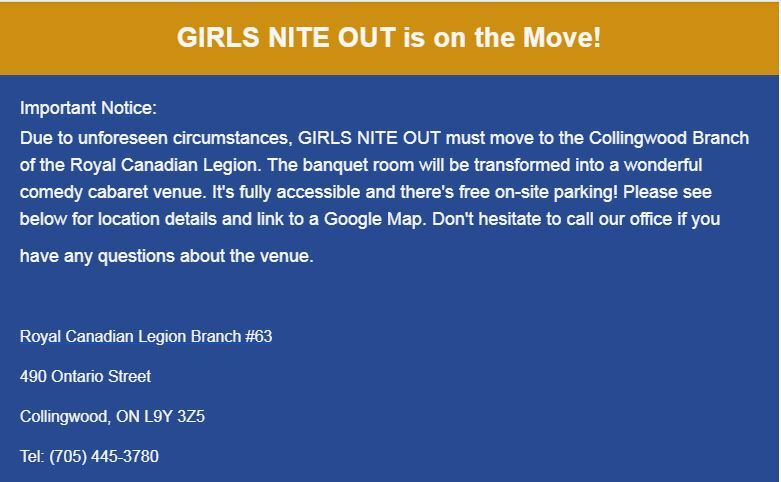 Girls Nite Out is an all-female, all funny, mix of stand-up and improv comedy. 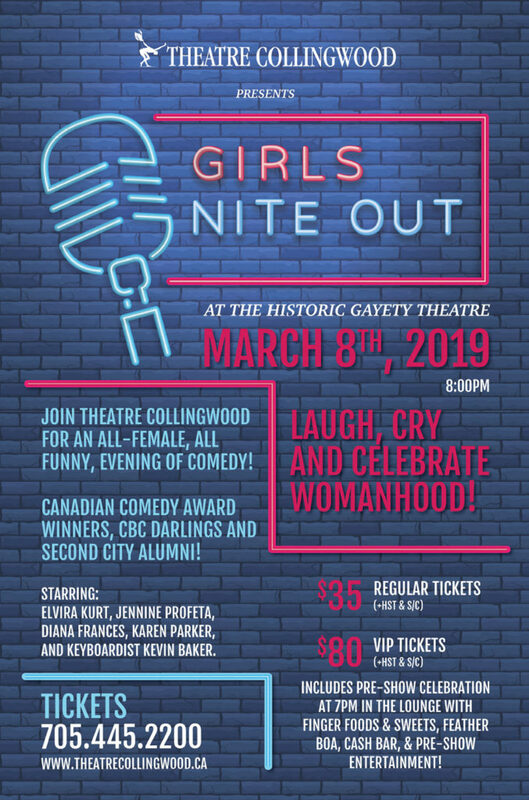 Led by the fearless & fabulous, Elvira Kurt, these Canadian Comedy Award Winners, CBC darlings and Second City alumni will make you laugh and cry (tears of laughter!) as they celebrate womanhood. Audience participation is encouraged, so grab your friends and join Theatre Collingwood for a fun-filled evening! Starring: Elvira Kurt (The Debaters, Baroness Von Sketch & so much more! 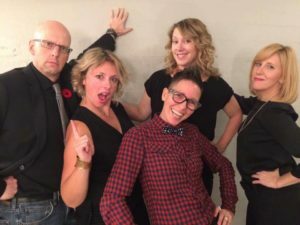 ), Jennine Profeta (The Second City Theatricals, “Howie Do It” w/Howie Mandel), Diana Frances (Just for Laughs, Corner Gas: The Animated Series) and Karen Parker (The Second City). VIP Tickets – $80 Includes pre-show celebration at 7pm in the lounge including finger foods & sweets, feather boa, cash bar, & pre-show entertainment. VIP tickets are available by phone 705-445-2200 or at our Box Office. Elvira Kurt is a Canadian Comedy Award-winning, Cannes Film Festival award winning (Real Women Seen), Toronto Fringe Festival Patron’s Pick (Parallel Play), sold out multi-solo show performing (Funny AF, Fearless, Homosexual Panic, Fired Up) and CSA nominated stand-up comic and Second City veteran whose credits as star, host, guest, writer and or talent director are simply far too many to mention. Except for these: Baroness Von Sketch Show, Iron Chef Canada, The Great Canadian Baking Show (Canadian Screen Award nominee), Master Chef Canada, SpinOff, NickMom Night Out NYC, The Debaters, Degrassi, YTV’s The Game, George Stroumboulopoulos Tonight, Cook’d, Popcultured with Elvira Kurt, Four Weddings Canada, Best House, The Gayest Show Ever, This Hour Has 22 Minutes, Ellen DeGeneres’ HBO special, Just For Laughs, Winnipeg, Halifax, Sydney and Melbourne Comedy Festivals and, of course, Elvira’s unforgettable stint on both of CBC Radio’s hit show, ‘Q’ and, ‘q’. Jennine Profeta is a performer, writer, corporate workshop facilitator and MC/host. 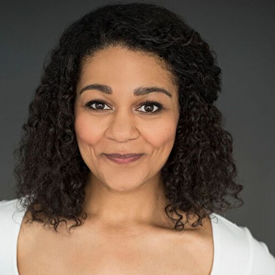 She has performed with The Second City (National Touring Company, Theatricals) across Ontario and aboard Norwegian Cruise Lines in the Mediterranean and Caribbean. 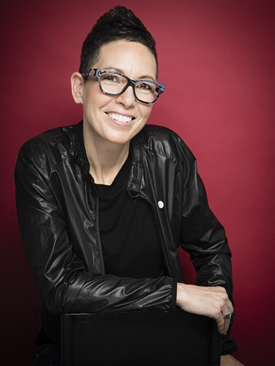 As a writer, Jennine has penned scripts for television – Ollie The Boy Who Became What He Ate (CBC), Opie’s Home (TVO), Gemini and Genie Awards, and CBC Radio, and waxed poetic for Chatelaine, Today’s Parent and Best Health magazines. She’s appeared in numerous commercials and summer theatre productions, and was a principal player in Howie Mandel’s “Howie Do It” for NBC. She’s thrilled to be back with her sister act, Girls Nite Out, now entering it’s 12th (!!!) year. 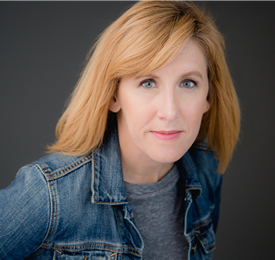 Karen is a three-time Canadian Comedy Award winning/Dora nominated actor and an alumnae of the Second City Toronto Mainstage (Facebook of Revelations, Tazed and Confused, Barack to the Future). She has Assistant Directed two MainStage shows, was Director of the National Touring Company , Family Co. and House Co. She has performed with theatre companies across Canada. 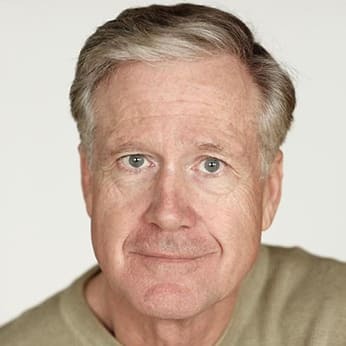 Selected film and television credits include: Designated Survivor, People of Earth, Baroness Von Sketch Show, Hemlock Grove, Beauty & The Beast, The Firm, Saving Hope, Being Erica, The Jon Dore Show and Instant Star. You can currently catch her onstage in the all female sketch revue “She the People”. 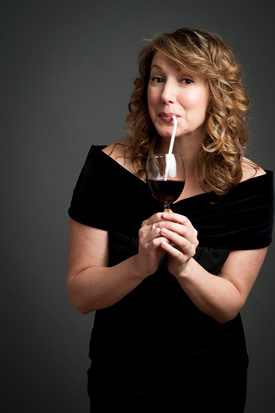 When not performing she is an acting and improv instructor at the Second City Training Centre and Making Box Theatre. Karen also travels the world teaching and performing with the Lusty Mannequins. The Lusty ’s recently took home the Best of the Fest award at the Toronto Sketch Festival. 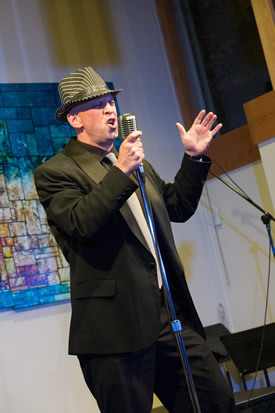 Kevin is a celebrated music and drama educator, entertainer, singer/musician and improv actor originally hailing from rural Saskatchewan. He began his music career performing in multiple bands and currently performs bass and background vocals with indie rock band “Nickeltree”. 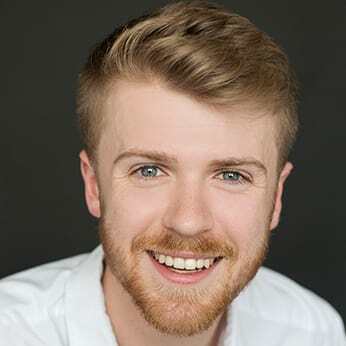 Kevin is a graduate of The Second City Training Centre’s Conservatory Program and was musical director for The Second City Training Centre, Education Company and understudy for the National Touring Company (Canada). He has also served as musical director for the Bad Dog Theatre Company and independent troupes such as Slap Happy and The Kate Ashby Improv Academy. 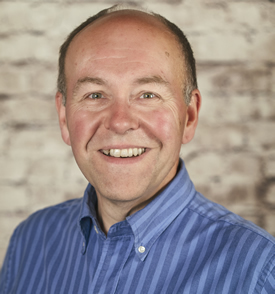 As an educator, Kevin specializes in instrumental/vocal music and the dramatic arts and currently serves the students of the Upper Canada District School Board, recently earning the “Trustees Innovation Award” for Teaching Excellence. MONDAY, FEBRUARY 11th at 7 pm. Love is Back in Town! 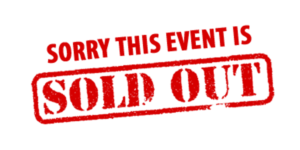 Reserve your seats for February 11th! There’s no need to drive to Toronto this winter because we’re bringing the stars to Collingwood! 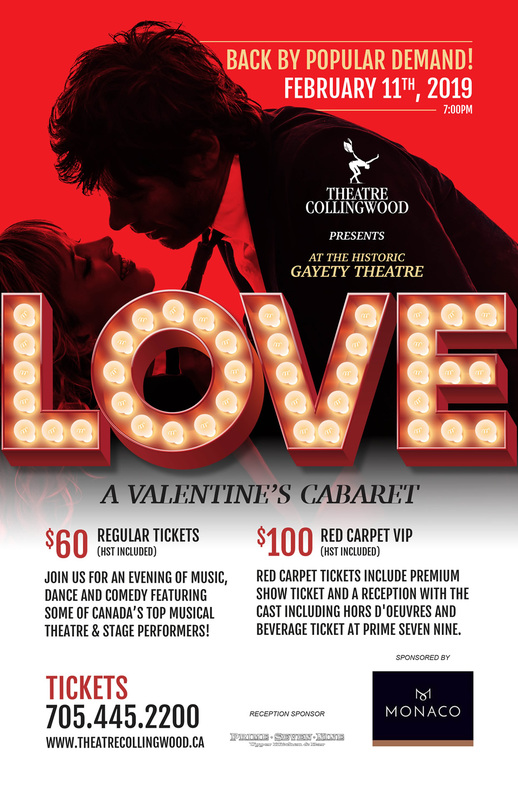 Join us for an evening of outstanding entertainment featuring some of Canada’s top theatre performers (scroll down for artist bios) in our LOVE Cabaret. And stay tuned as we add more names to the list of our incredible talent! It’s the 5th Anniversary of this popular fundraiser that sells out each year. 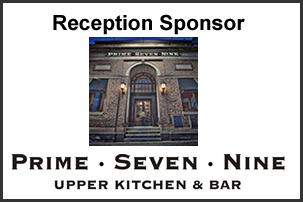 So, gather your friends and join our RED CARPET VIP guests who will not only see the show but will also celebrate with the performers at our after-party at Collingwood’s hottest new restaurant, PRIME SEVEN NINE! 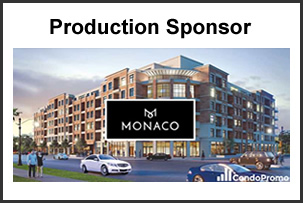 RED CARPET VIP – $100 Includes reception with hors d’oeuvres and a beverage ticket. A portion of your VIP ticket is a charitable donation to Theatre Collingwood and you will receive a $20 Tax Receipt. VIP tickets are available by phone 705-445-2200 or at our Box Office. All Ticket prices include HST & service charge. Produced by Erica Angus and Theatre Collingwood. John, Paradises Lost (SummerWorks Festival), and Audrey II in Little Shop of Horrors (Lower Ossington Theatre and T3 productions). Musical Direction credits include A Misfortune (Next Stage Festival), HAIR (FirstAct Productions), One Song Glory ’10 ’11 & ’12 (ActingUp Stage), A Joyful Noise (co-composer/lyricist, Smile Theatre), Mickey & Judy (Toronto Fringe), and bare: the Canadian Premiere (WatersEdge Productions). 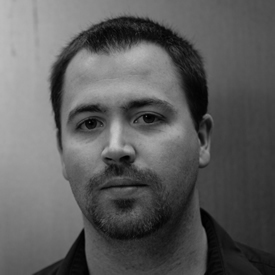 Chris has also worked as an accompanist and teacher at Sheridan College, Randolph Academy and George Brown College. He has toured extensively with the Nathaniel Dett Chorale as a singer and with Sharron Matthews as an accompanist/arranger (Sharron’s Big Broadway Show, Jesus Thinks I’m Funny, GOLD, Full Dark). Leah Allyce Canali is a Boston born, Toronto based vocalist with a BA in theatre performance from Northeastern University. Most recently Leah was a featured vocalist in A Very Christerical Christmas Cabaret at, you guessed it, Theatre Collingwood!! She is thrilled to be back for this show! Leah has performed internationally for such companies as Celebrity Cruise Lines, Spirit Entertainment and Pure Energy Entertainment. She has sung for both the Boston Red Sox and the New England Patriots and was a featured singer at the Official Inaugural Ball (Boston) of President Obama. 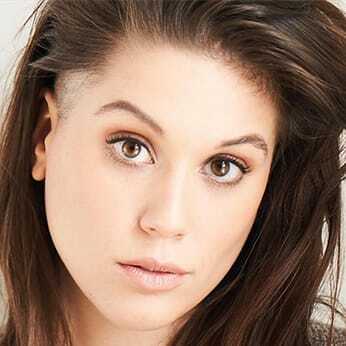 Leah has a successful YouTube channel, that has been featured on NewNowNext, Gay Star News, and the Wow Report. She has performed on the main stage of Pride Toronto with Toronto Drag Legend, Tynomi Banks, opening up for such acts as RuPaul and Brandi! 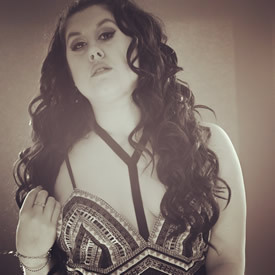 In addition to Toronto Pride, some of Leah’s most notable performances have been at Digital Pride, Mirvish Productions, “Bombshell” and “Limitless” shows, choreographed by Scott Fordham (Nelly Furtado, Deborah Cox), and as a featured vocalist at “Posers” in Los Angeles. Leah also has a bi-weekly residency at Statlers in Toronto’s LGBTQ Village. She is currently the lead vocalist for Toronto based soul band, The St. Royals. Alexis hails from London, Ontario. Selected theatre credits include four seasons at The Stratford Festival: Virgilia in Coriolanus, The Fantasticks, The Tempest, Sarah Brown in Guys & Dolls, Anne in A Little Night Music, Julie in Carousel, Clara in Passion, The Lion, The Witch and the Wardrobe, The Sound of Music. Mom/Steph/Heather in Hook Up (Tapestry Opera/Theatre Passe Muraille), Belle in A Christmas Carol (Grand Theatre), Sunday in the Park With George (TIFT), The Gravitational Pull of Bernice Trimble (Factory/Obsidian); Obeah Opera (Nightwood); Starbright Christmas, Canada Sings, Godspell (Petrolia Playhouse); Titania in A Midsummer Night’s Dream (Driftwood). Awards: Banks Prize for Emerging Artists (Musical Stage Co). Education: BFA Acting, University of Windsor. Upcoming: Fiona in Brigadoon and Leila in Rope at The Shaw Festival. Andrew is a solidly trained and versatile dancer as well as a musician, singer and actor. He is quickly becoming one of the leading tap dance artists in Canada, teaching and choreographing across North and South America. Andrew is an award-winning actor, composer and writer, having recently had his self-produced short film officially selected in 12 festivals around the world and winning 4 awards including BEST SHORT FILM. Andrew was a featured singer and dancer on the 20th Anniversary World Tour of RIVERDANCE after which he performed in ANYTHING GOES with Drayton Entertainment, the record-breaking world premier of MONSOON WEDDING, played Cogsworth in Young People’s Theatre production of BEAUTY AND THE BEAST, Boutons in CINDERELLA at Neptune Theatre, and will be in Mirvish’s production of JUKEBOX HERO THE MUSICAL in February 2019. 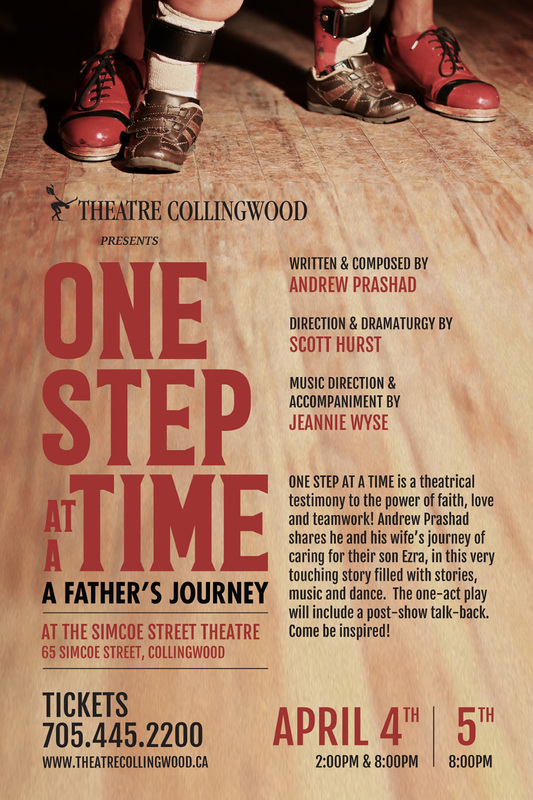 We are delighted to present his one man show “One Step At A Time” at The Simcoe Street Theatre April 4th & 5th. SHAW 2018: Appeared in and assistant choreographer for Grand Hotel, appeared in Oh What a Lovely War; 6th season. David will be returning to Shaw Festival in 2019 to perform in Brigadoon and The Horse And His Boy. (Selected Credits) FOR THE SHAW: 1837: The Farmer’s Revolt, Me and My Girl, Sweeney Todd, Our Town, The Next Whisky Bar, Pygmalion, Sweet Charity, Juno and the Paycock, Cabaret, Major Barbara, Guys and Dolls. ELSEWHERE: choreographer for Candide, appeared in Kiss of the Spider Woman, The Inspector General, Bye Bye Birdie, Talk Is Free Theatre; Cinderella, Snow White, Ross Petty Productions; Ren in Footloose, Rainbow Stage; Queen for a Day: The Musical, April 30th Productions; Rent, Oklahoma!, Love’s Labour’s Lost, The Drowsy Chaperone, Theatre Sheridan; Anne of Green Gables: The Musical, The Full Monty, Charlottetown Festival; Sleeping Beauty, Theatre by the Bay. AWARDS: Brian Linehan Triple Threat award (3-time winner). TRAINING: Sheridan College – Music Theatre Performance. 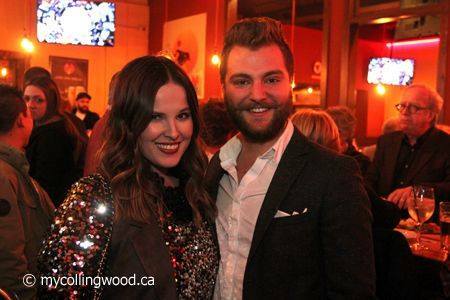 Scott is happy to return for his third helping of Collingwood LOVE!, and he sends a big sloppy thank you to Erica Angus for including him again this year. 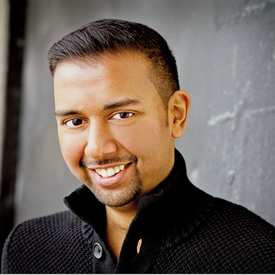 In April patrons will hear him, if not see him, in Andrew Prashad’s ONE STEP AT A TIME at the Simcoe Street Theatre, and in May Scott heads to Regina to appear in the Globe Theatre’s production of Beauty and The Beast. 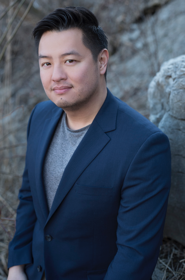 Colin Asuncion is a Toronto based performer and marketing professional. He has performed in musicals, plays, concerts, cabarets, and even a handful of television appearances. He most recently performed in Chris Tsujiuchi’s Very Chris-terical Christmas Cabaret at the Historic Gayety Theatre. He has also produced a number of solo cabarets and was a 2018 BroadwayWorld Toronto nominee for Best Cabaret Performance. By day, he is the Marketing Communications Manager for myBlueprint, a tech company that develops career/life planning software for Canadian students. Originally from Wales, Natasha has spent her adult life performing in live bands and various musical outfits across the UK, as well as in theatre, film and television. Now living in Canada, she is happy to be able to continue the trend! Shealyn Angus is a powerhouse singer who spends her days working in the business of LOVE, which makes it only fitting she play a part in this LOVE cabaret. 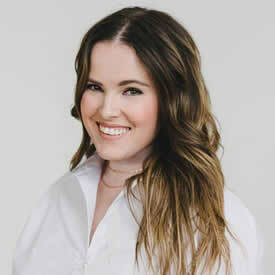 She owns Shealyn Angus Weddings & Events and has been featured in such respected magazines as WedLuxe, Wedding Bells, and The Toronto Globe & Mail newspaper. She is a graduate of the Creative Ensemble program at York University, and has sang at the Toronto Raptors, Toronto Maple Leafs and Toronto Marlies games, The Women of Influence Awards at The Royal York, and in many cabarets and nightspots. Shealyn may have been the reason for the LOVE Cabaret taking the year off in 2018, as she was giving birth at the time to Executive Director Erica Angus’ first grandchild! She is thrilled to be back for this very special event. Kevin Wong is a composer-lyricist, singer/musician, dramaturg. Past works include: Recurring John: A Song Cycle, STAR! (ving): A Collection of Songs; Misprint (with bookwriter Lauren Toffan, Women of Musical Theatre Festival 2016); Drama 101 (with bookwriter & co-lyricist Steven Gallagher, Bravo Academy 2017 / Etobicoke School of the Arts 2018 / Stage Door Academy 2018); and Reframed (Musical Stage Company / Art Gallery of Ontario, Dora Nomination – Best New Musical/Opera). Currently in Development: The Preposterous Predicament of Polly Peel (Act One) (with bookwriter Julie Tepperman, most recently a sold-out hit at the 2018 Toronto Fringe Festival and winner of the 2018 Playwrights Guild of Canada Stage West New Musical Award), and In Real Life (working title) (with bookwriter & co-lyricist Nick Green, most recently presented in reading at the 2018 Canadian Music Theatre Project’s Festival of New Musicals at Sheridan College). Kevin was the Musical Stage Company’s Associate Artistic Director from 2016-2018. 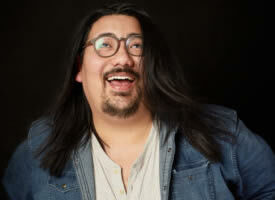 He is a member of the vocal group Asian Riffing Trio (with Chris Tsujiuchi and Colin Asuncion). Kyle Golemba has performed across the country from Nanaimo, BC to Summerside, PEI, including seasons at the Charlottetown, Shaw, and Stratford festivals. His favourite roles (so far!) have been Dickon in The Secret Garden, Bobby in Cabaret, Andy Lee in 42nd Street, Robert Martin in The Drowsy Chaperone, Antipholus of Ephesus in The Comedy of Errors, Eddie in Funny Girl, and Gilbert in Anne of Green Gables. 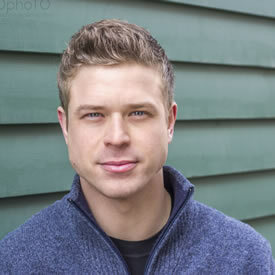 Along with his best friend, Adam White, Kyle created a revue of Canadian musical theatre called Making Love in a Canoe. You can check out the show’s album on iTunes! 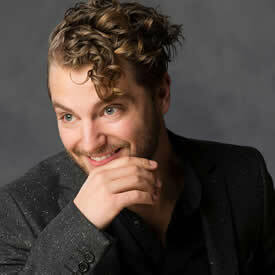 This year, Kyle will be appearing at the Shaw Festival in Rope and Brigadoon. He’s delighted to have been invited to celebrate love here in Collingwood tonight. Born in Stratford, Ontario, at the age of four Michael began lessons on the violin. After years of lessons, the violin was set aside in favour of the clarinet. The clarinet was soon replaced by the saxophone and after playing the saxophone for only one year, Michael auditioned and was cast for a part in Meredith Wilson’s “The Music Man” at The Festival Theatre when he was only thirteen years old. During high school Michael learned the trumpet as well as the bass guitar. At seventeen he became the bassist/saxophonist and singer of the ska band “Running On Empty” and recorded 2 albums. He attended the Kincardine Jazz Festival in 2001 and 2002, including clinics and master classes, which greatly influenced his decision to attend Humber College to study music and purchase his first upright bass. After graduating Mike performed internationally and with a multitude of bands and performers. 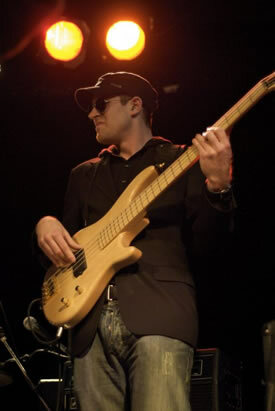 He is a freelance musician in Toronto and can be seen performing with such groups as Parkside Drive (Top 40), Carlo Beradinucci, La-nai Gabriel and the Free People (Reggae/Hip Hop), and Pure Finesse (Funk-Art Rock). Scott Neary is an international touring musician and award winning guitarist/composer/arranger. He is a graduate of the University of North Texas Master’s of Music program, where he was a member of the Grammy Nominated One O’Clock Lab Band, and can be heard on their recording Lab 2013. From Wabush, Labrador, Scott now lives in Toronto as a freelance guitarist/pianist/vocalist, songwriter, arranger, producer, and music director. You can hear him on Ilios Steryannis’s The Bethany Project (2018), and Leslie Huyler’s Thank You (2017), and as a member of The Hit Pickers. Separately, they are 3 prominent powers.